Box Text: It's Friday night. 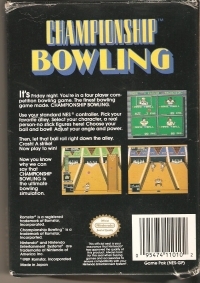 You're in a four player competition bowling game. 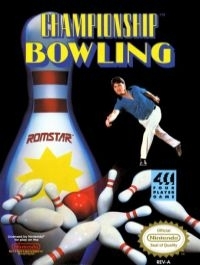 The finest bowling game made. CHAMPIONSHIP BOWLING. Use your standard NES controller. Pick your favorite alley. Select your character, a real person-no stick figures here! Choose your ball and bowl! Adjust your angle and power. Then, let that ball roll right down the alley. Crash! A strike! Now play to win! Now you know why we can say that CHAMPIONSHIP BOWLING is the ultimate simulation. 11-22-2013 nintendojuggalo Box Text It's Friday night. You're in a four player competition bowling game. 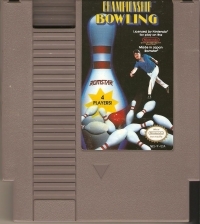 The finest bowling game made. CHAMPIONSHIP BOWLING. Use your standard NES controller. Pick your favorite alley. Select your character, a real person-no stick figures here! Choose your ball and bowl! Adjust your angle and power. Then, let that ball roll right down the alley. Crash! A strike! Now play to win! Now you know why we can say that CHAMPIONSHIP BOWLING is the ultimate simulation. 06-29-2012 pacpix Box Text It's Friday night. You're in a four player competition bowling game. The finest bowling game made. CHAMPIONSHIP BOWLING. Use your standard NES controller. Pick your favorite alley. Select your character, a real person-no stick figures here! Choose your ball and bowl! Adjust your angle and power. Then, let that ball roll right down the alley. Crash! A strike! Now play to win! Now you know why we can say that CHAMPIONSHIP BOWLING is the ultimate simulation. This is a list of VGCollect users who have Championship Bowling in their Collection. This is a list of VGCollect users who have Championship Bowling in their Sell List. This is a list of VGCollect users who have Championship Bowling in their Wish List.